Here are a few surprising facts for World Pneumonia Day (November 12). Pneumonia is still the single largest cause of death in children under five, responsible for 16 per cent of all deaths. Last year alone, almost 1 million children under five died from pneumonia. The impact of pneumonia is most potent among the poorest and most marginalized and it can be prevented with simple interventions. In 2015, the disease took the lives of 922,000 children under five around the world. This means a loss of over 2,500 child lives every day, or over 100 every hour. Since 2000, the number of child deaths caused by pneumonia have decreased by 47 per cent. The tremendous progress made is due in part to the rapid roll-out of vaccines, better nutrition and improved care-seeking and treatment for symptoms. However, pneumonia hasn’t declined as quickly as other diseases such as malaria (58 per cent), HIV/AIDS (61 per cent) and measles (85 per cent). The number of child pneumonia deaths around the world varies significantly and the world’s poor are often the hardest hit. 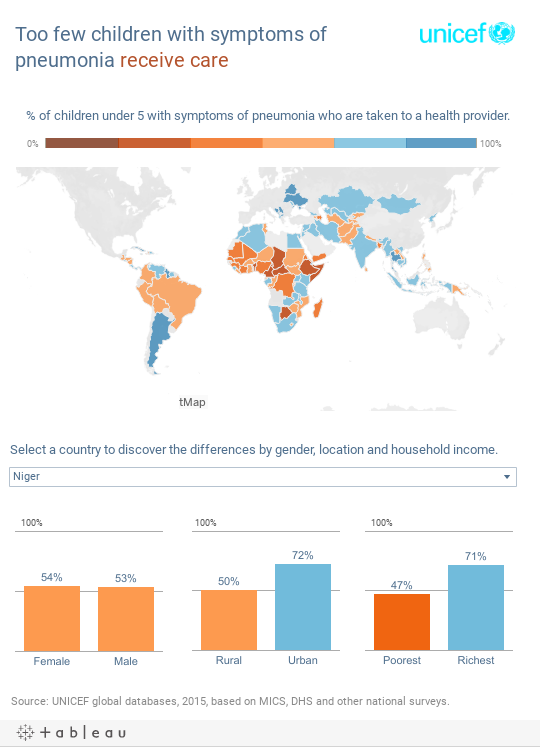 Nearly two-thirds of childhood pneumonia deaths are concentrated in just 10 countries: India, Nigeria, Pakistan, Democratic Republic of the Congo, Ethiopia, Angola, Indonesia, China, Chad and Afghanistan. The fight against pneumonia-related deaths in children relies on prevention, protection and, when infections do occur, on better treatment. Prevention – Vaccines can prevent pneumonia deaths. The roll-out of two recent vaccines, the Haemophilus influenzae type B (Hib) vaccine and the pneumococcal conjugate vaccine (PCV) has been the most recent preventive effort. Measles and pertussis (whooping cough) vaccines are also essential for preventing infections that can lead to pneumonia as a complication. Protection – Exclusive breastfeeding for the first six months of life is an effective way to protect children from pneumonia and other infectious disease. In addition, good nutrition for older children, hand-washing, clean water, good sanitation, clean indoor air pollution, free from cook stoves and tobacco smoke, can also help protect children from pneumonia. Treatment – Saving children from pneumonia requires urgent action and recognizing danger signs – including fast and difficult breathing and a cough –is the first step. The treatment for most types of serious pneumonia is usually antibiotics, which typically cost less than 50 cents for a full treatment. Many children who show symptoms of pneumonia don’t receive care! Taking children to a health care provider quickly can save their lives, yet, worldwide, only 3 in 5 children receive the necessary help and care. In sub-Saharan Africa, where most pneumonia deaths occur, only 2 in 5 children with pneumonia symptoms are taken for care. Take a look at our interactive dashboard below and you will see that in most countries, children from the poorest households and those from rural areas are much less likely than their peers to get the life-saving care they need. Agbessi Amouzouis is a Senior Statistics and Monitoring Specialist in the Division of Data, Research and Policy at UNICEF. Liliana Carvajal is a Statistics and Monitoring Specialist in the Division of Data, Research and Policy at UNICEF. unicef remains the essence of global family proudness.